You are here: Home / About Farming & Food / Is There Too Much Sugar in Flavored Milk? Is There Too Much Sugar in Flavored Milk? Do your kids love to drink flavored milk? Do you worry that there is too much sugar in flavored milk? All milk has natural sugars, and it is a nutrition powerhouse, flavored or plain! 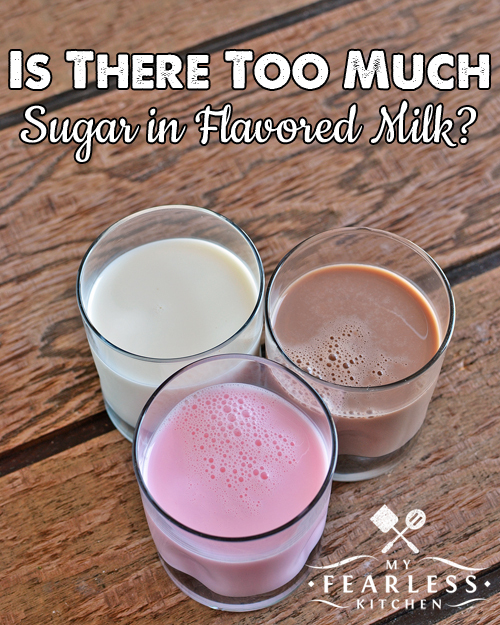 No, there is not “too much” sugar in flavored milk. But in order to really answer this question, we need to take a look at the overall nutrition in milk, and the amount of sugar in white milk. Yes, “regular” milk has sugar, too! Milk – whether you choose fat free, low fat, reduced fat, or whole – is a very nutritious food. One 8-ounce serving has 8 grams of protein, 25% of your recommended daily intake of Vitamin D, and 30% of your recommended daily intake of calcium. It is also packed with lots of niacin, Vitamin A, Vitamin B12, riboflavin, phosphorous, and potassium. One 8-ounce glass of low fat milk (1% milk) has only 100 calories. One 8-ounce glass of whole milk has only 150 calories. So over all, you can’t beat milk for a nutrition powerhouse! But what about adding flavors? What does that do to the nutrition in milk? Is Flavored Milk Good For You? Adding flavors to milk doesn’t change the nutrition very much. Flavored milk still has 8 grams of protein, 25% of your recommended daily intake of Vitamin D, and 30% of your recommended daily intake of calcium. The amounts of other nutrients don’t change, either, so you’ll still get plenty of niacin, Vitamin A, Vitamin B12, riboflavin, phosphorous, and potassium. How Much Sugar is in Flavored Milk? Flavored milk does have more sugar than white milk. But all milk has sugar – it’s lactose, the naturally occurring sugar in milk. Should I Let My Kids Drink Flavored Milk? Flavored milk is not bad for your kids. Yes, it does have a little more sugar than white milk. But the “extra” sugars in flavored milk only account for 3-4% of the sugar in children’s diets (ages 2-18). Soda and other sweetened drinks account for up to 40% of the sugar in children’s diets! When flavored milks were taken out of schools, kids drank 35% less milk! Athletes are turning to chocolate milk as a refueling drink after a workout. It has the protein you need to build muscles, the fluid and electrolytes to replace what you lost during activity, and the carbohydrates/sugars you need to refuel your energy needs! Because chocolate milk has more carbohydrates than white milk, it actually has a better balance of the nutrients your body needs to recover from a workout. So, yes, flavored milks have more sugar than white milk. But flavored milk doesn’t have “too much” sugar. Flavored milk also has so many more good nutrients! Don’t overlook the overall nutritional benefit of chocolate milk or strawberry milk just because it has a little more sugar than white milk. Flavored milk is a great way to help your kids get their recommended 2-3 cups of dairy every day as part of their balanced diet. Is Organic Milk Better For You?